It is important to know the visual sensitivity to optical blur from both a basic science perspective and a practical point of view. Of particular interest is the sensitivity to blur induced by spherical aberration because it is being used to increase depth of focus as a component of a presbyopic solution. Using a flicker detection-based procedure implemented on an adaptive optics visual simulator, we measured the spherical aberration thresholds that produce just-noticeable differences in perceived image quality. The thresholds were measured for positive and negative values of spherical aberration, for best focus and + 0.5 D and + 1.0 D of defocus. 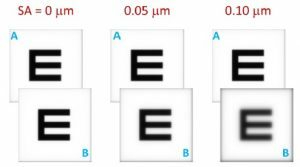 At best focus, the SA thresholds were 0.20 ± 0.01 µm and −0.17 ± 0.03 µm for positive and negative spherical aberration respectively (referred to a 6-mm pupil). 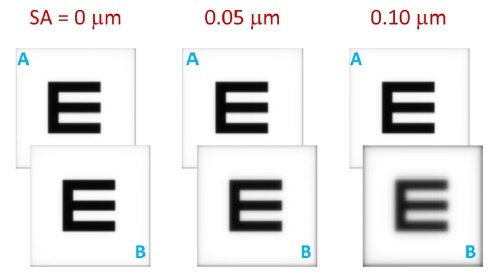 These experimental values may be useful in setting spherical aberration permissible levels in different ophthalmic techniques.